If you want to follow the pro-level tactical training that produces real results, here is your chance! IM Mat Kolosowski complied over a decade of tactical experience in a single 4-hour crash course. He arms you with the in-depth understanding of 8 tactical themes for successfully outplaying your competition. Every club player dreams of having Grandmaster level TACTICS. Wouldn’t it feel wonderful to effortlessly identify tactics, find the strongest moves and finish off games in style with a checkmate or huge material gain? And that’s not all tactics provide. Whether you’re attacking, defending, fighting in the endgame, exchanging pieces or playing an opening, superior tactical ability often DECIDES the game! Tactics are in every move. Tactical ability is by far the most powerful universal weapon a chess player can possess. It is one of those “super skills” that you apply automatically, after each and every move. Your tactical ability greatly determines your overall chess level! Even small improvements in tactics guarantee a boost in your overall chess performance and results. Wouldn’t it make sense to work on something that decides over 99% of your games? As a result, they get frustrated and don’t see any improvements at all. If you want to follow the pro-level tactical training that produces real results, here is your chance! IM Mat Kolosowski complied over a decade of tactical experience in a single 4-hour crash course. He arms you with the in-depth understanding of 8 tactical themes for successfully outplaying your competition. This is a “hands-on” course, meaning that you will actively participate in the training. It includes on-the-spot analysis that is helpful for your pattern recognition and visualization. Mat also reveals tactical training secrets that are used primarily by 2600- and 2700-rated GMs as well as the structured approach for increasing your tactical ability. Unleash your potential and become the chess player you meant to be! Train the important move sequences with a set of specifically designed tasks and challenges. Practical part is an important element of the course. 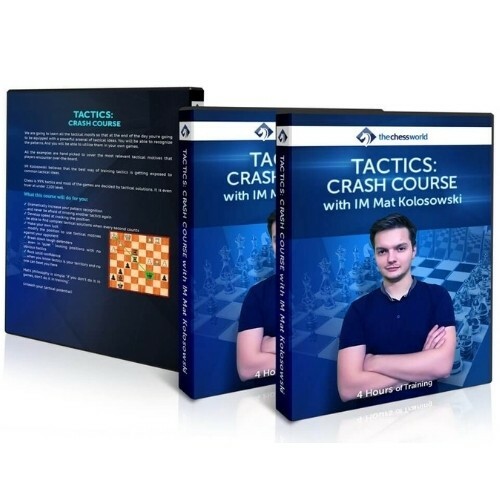 Watch IM Kolosowski outplaying his competition with the Tactical ideas, principles, and plans demonstrated in the course. This extra video will help you see how everything works together!